When you stroll beneath the famous blue gate of Bab Boujeloud, you are seemingly transported 1,000 years back in time. The bustling cafés and outdoor markets quickly give way to quiet narrow streets where children are hard at play and donkeys are hard at work carrying supplies up and down the twisting, mud brick corridors of the medieval city. This is the oldest part of Fez, Fez el-Bali, and it is the world’s largest car-free urban space as well as a UNESCO World Heritage Site. This is where most travelers spend their time in Fez. As you walk through Fez el-Bali, you are literally walking through 1,300 years of Moroccan heritage that has only recently been touched by the advent of globalization and the recent influx of tourists.Even with this uptick in tourism, the magic of Fez endures. The city has endured through so much history. Ancients mosques and medersas (often: madrassas, these are Islamic schools) are dotted through this labyrinthine city. Though non-muslims are not allowed into any of the mosques, there are two medersas — Medersa Bou Inania and Medersa el-Attarine — both of which give a sense of the splendor of the Islamic architecture. Note the balance of complex stucco and tile work used to decorate these architectural gems! Besides the labyrinthine Fez el-Bali, there are two other parts to the city: Fez el-Jdid (the “new part of the city”, which is still a few hundred years old) and Ville Nouvelle (French for new city, constructed under the French Protectorate era in the first half of the 20th century). Though most of the activities and sites of interest to travelers is in the old city, many travelers do find themselves venturing into Fez el-Jdid to visit the Jewish Quarter, Batha Museum and to take a stroll in the Jnane Sbil gardens while most avoid the Ville Nouvelle altogether, unless they are traveling to the airport, train station or getting a bite to eat somewhere a bit more modern than the offerings in Fez el-Bali. There is a continuous play between the bustle of small, winding medina passages and the quiet, reflective interior spaces that give Fez its charm. Today, the past mixes with the present in some unexpected ways for you to discover. All of this makes Fez a must-see destination. Here is a map of the Fez medina. We include a similar map of Fez in each itinerary packet that travelers receive before their tour takes place with us at Journey Beyond Travel. Besides the labyrinthine Fez el-Bali, there are two other parts to the city: Fez el-Jdid (the “new part of the city”, which is still a few hundred years old) and Ville Nouvelle (French for new city, constructed under the French Protectorate era in the first half of the 20th century). Though most of the activities and sites of interest to travelers is in the old city, many travelers do find themselves venturing into Fez el-Jdid to visit the Jewish Quarter, Dar Batha Museum and take a stroll in the Jnane Sbil gardens while most avoid the Ville Nouvelle altogether, unless they are traveling to the airport, train station or getting a bite to eat somewhere a bit more modern than the offerings in Fez el-Bali. Fez is a medieval city, a heritage site, and for centuries life has largely gone on unchanged. You’ll find that with globalization, Fez has become a melting pot of languages. Most store owners, waiters and other workers know or understand Arabic, French, English and many other languages. More and more, Moroccans are happy to practice English and will be happy to tell you that Morocco was the first country to recognize the United States of America as an independent country. There is a continuous play between the bustle of small, winding medina passages and the quiet, reflective interior spaces that give Fez its charm. Today, the past mixes with the present in some unexpected ways for you to discover. All of this makes Fez a must-see destination for anyone in Morocco. Fez was founded in 789 A.D. by Moulay Idriss II, the son of the founder of modern Morocco, though the origin of the city’s name is unknown. Some scholars believe it comes from the old Berber name of the Middle Atlas mountains, Fazaz; while other stories trace the name back to a tale of a golden axe that divided the river of Fez into two halves (in Arabic, a fez is an axe). It wasn’t until 817-18 A.D., when around 800 refugee families from Cordoba in Spain settled in Fez, followed a few years later by over 2,000 families from Tunisia, that Fez really began to grow. These settlements fought each other for over 300 years. It wasn’t until the arrival of the Almoravid empire in 1070 A.D. that the city had some measure of peace. Under Almoravid rule, the city of Fez took form and the walls of Fez, walls which still form the outline of today’s Fez El-Bali, were erected. By 1170 A.D., Fez was the largest city in the world with over 200,000 people living in it. It was an important trading hub, serving Africa and Europe, the gold route from Timbuktu, the famous tanneries with their fine reputation for making leather shields. When the Merenids took control of Morocco in 1250 A.D., they made Fez their capital. This is when Fez el-Jdid, the “new” city, was built with wider streets, gardens, and many administrative centers. This is also when Fez really became a cultural and intellectual hub and the “Fassi” style, a mis of Andalusian and Almohad traditions, was given birth. The Medersa Bou Inania and Medersa el-Attarine are excellent examples of the ornate architecture from this period. Today, Fez is known as the “Athens of Africa” and the “Mecca of the West” for its history and role as the spiritual and learning capital of Morocco. 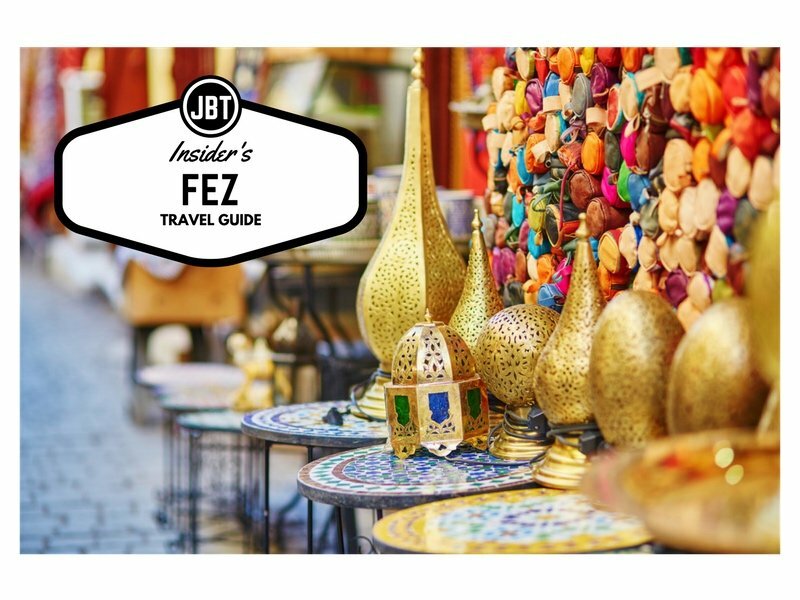 Fez Travel Guide: What to Do? Get Lost! – The old city of Fez is a medieval labyrinth of small, winding streets. Many kids will tell you if you are reaching a dead end. An easy way to find your way out of the maze is to understand that Fez is shaped like a bowl. You will be walking downhill to enter the maze, which means you will have to walk uphill to get out… though you may find yourself somewhere unexpected. It’s a good idea to have change for a taxi to easily get from one “gate” of the city (like Bab Boujeloud) to another. If you can plan for a day to “get lost” in Fez, you will have a day to remember for a lifetime. Stroll the Talaa Kebeera – Talaa Kebeera is the largest “street” in Fez. It begins shortly after Bab Boujeloud and continues on through the much of the medina. Many different shops, souks and sights are located just off this main artery. Though often crowded by locals and tourists alike, it is a nice taste of old Fez. 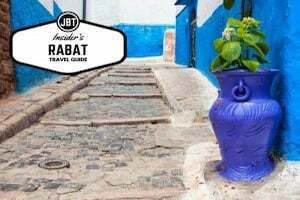 Take a Guided Tour – Though less adventurous than getting lost, a guided tour through Fez is a great way to learn some of the history and orient yourself to this confusing medina. This is one of many included activities that one can enjoy on a private Morocco tour with our team. In Fez, you’ll chat with your local city guide about your interests before heading out for a full-day of exploration. Go to a Hammam (A Traditional Moroccan Bath) – After a couple of days in Fez, there is nothing like scrubbing yourself clean. There are several local hammams (or “public baths”) if you are interested in a local experience. You can ask the staff at your lodgings for the closest local hammam and they will happily show it to you and tell you the hours, they vary by location. You will need to bring your own soap, towel, scrub brush and other amenities. Most riads offer a more upscale experience with private and couples spa and massage. Sacred Music Festival – Held every June, the Sacred Music Festival is one of the largest music festivals in Morocco featuring music from around the world. In 2013, the festival will be held from June 7 – 15th with an Andalusian theme. Visit the Fez Sacred Music Festival website for up-to-date details. Bab Boujeloud – Bab Boujeloud (Bab Bou Jeloud), commonly known as the “Blue Gate,” serves as the principle entrance to the old Medina in Fez and a good meeting point for groups. Through this gate, you can access the Talaa Kbeera (big hill) to your left and Talaa Sghira (little hill) to your right, past a series of restaurants all serving fairly similar Moroccan-style food. Both the Talaa Kbeera and Talaa Sghira are roads that lead down through the main thorough fares into the old medina and merge with each other further into the medina, near the Henna Souk. Bab Boujeloud and its immediate surrounding were all constructed around the turn of the 20th century. Notably, the French-built gate is blue on the exterior and green on the interior and bolted from the inside. Both façades decorated with elaborate zellij work and well worth a photo-op. Medersa Bou Inania – You will see the green-tiled minaret of the Medersa Bou Inania jutting into the sky as you enter through the great blue gate of Bab Boujeloud into the old medina. The medersa is one of the greatest examples of the Merenid architecture in the 14th century. It might be best to visit the medersa with a tour guide to avoid any hassles as sometimes non-Muslims are forbidden entrance because of the prayer times (Opened all days except Friday, hours vary, 10 dhs). Tanneries – “The smell is free… but if you want to buy, you have to pay,” the guides often say. You will probably hear people asking you if you want directions to the tannery. Just remember, on warm days, you won’t need directions — just follow your nose. There are a couple of shops that sell goods in the local tanneries. Many of them have terraces where you can, without cost, look down on the terraces. Though entrance and a look at the tanneries if free, you may get guilted into buying some handmade Moroccan leather goods. Open every day except Friday. Free. The University of Al-Qarawiyyin (also: Al-Karaouine) – The Al-Qarawiyyin (al-Karaouine) Mosque and University in Fez, Morocco was founded by Fatima al-Fihri, a woman who had fled her homeland of Tunisia for Morocco, in 859 AD. UNESCO considers it to be the oldest university in the world. The libraries have several extremely valuable documents dating from c. 780 A.D. including the Al-Muwatta of Malik written on gazelle parchment and, excitingly, will be open very soon for the public! Medersa al-Attarine – Located next to the Qarawiyyin mosque in the middle of the medina, this is the other medersa opened to non-muslims. Like the Medersa Bou Inania, ornate tile, stucco and wood word decorate this wonderful, nearly 1,000 year old medersa. Ask if you can go upstairs to peak at the student quarters. (Opened all days except Friday, hours vary, 10 dhs). Fondouk el-Nejjarine – The Fondouk el-Nejjarine (also known as the “Wood Museum” and the Musée de Bois) faces the old Place el-Nejjarine or the “Carpenter’s Square.” The fondouk was constructed in the 18th century and originally served as a “caravanaserai” or “roadside inn” for travelers and traders. A former minister spent 25 million dirhams (about 3 million USD) to restore this fondouk and transform it into the museum it is today. Visitors will want to spend an hour or so in this wonderfully restored building learning about the woodwork indigenous to Morocco, the tools used, as well as a collection of wood and cabinet work — both ancient, dating from the 14th century, as well as more modern pieces — from various regions in Morocco. Make sure you leave time to visit the rooftop terrace, one of the best views of Fez. A beverage will set you back 10dhs. (Open 10am – 5pm daily; 20 dhs). Henna Souk – There are many souks (usually a large square of shops) interwoven throughout the medina, often blending into each other with little evidence you’ve moved from one souk to the other. However, toward the bottom of the medina, just off Trek K’beer, you can find the Henna Souk, a nicely shaded souk cozied up beneath a couple of large plane trees. Leo Africanus once worked in the now-defunct psychiatric hospital here built in the 1,300s. Pottery and traditional cosmetic products can be found here, so if you wanted to grab argan oil or any other Moroccan goods, talk to Mohammed in the last cosmetic stall near the old hospital. Nejjarine Square and Museum – Located near the carpenter souk in the middle of the medina, this beautiful square is dotted with Andalusian-style architecture dating from the 18th century. The museum in situated in a former funduq that a former minister spent 25 million dirhams (about 3 million USD) to restore. The museum showcases woodworking tools along with a collection of wood and cabinet work, both ancient and modern from various regions in Morocco. Open seven days a week. 10am – 7pm. 10dhs. Batha Museum – Located in a Moorish palace dating from the 19th century, the Dar Batha Museum museum houses many artifacts, sculpted wood, plaster, jewelry, carpets and pottery. 9am-5pm, closed Tuesdays and holidays, 10Dh. Mellah – The Mellah, or Jewish Quarter, of Fez was established in 1438. It is the oldest of the mellahs in Morocco though very few Jewish people live here today, most of them having moved to Casablanca, France or Israel. The Mellah section today is well worth a stroll with it ornate balconies and wrought-iron windows. There is a great view from the terrace of the Danan Synogogue on rue Der el-Ferah Teati and the Jewish cemetery is worth a visit, though be wary of faux guides and people asking for money at the cemetery; it’s best to go with a knowledgeable guide if you want to avoid being hassled. You can read more about Jewish areas in Morocco if you’d like. 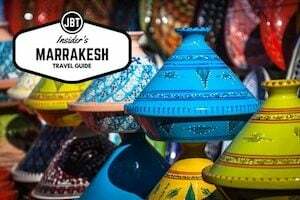 Fez Travel Guide: Where to Eat? Some of our favorite restaurants are listed below. For a more complete selection of restaurants searchable by location, cuisine and price, check out Best Restaurants of Morocco. Dar Roumana – Mediterranean cuisine with seasonal, local ingredients assembled by a French chef. Lunch and dinner are served in the courtyard. Fez Medina, near Bab Guissa and Ain Azlitan. +212 (0) 5 35 74 16 37 or +212 (0) 6 60 29 04 04. Open Tues – Sat. Reservations required (ideally one day prior). Restaurant 7 – French cuisine in a minimalist atmosphere. Black and white decor, classical music. Surprisingly great for vegetarian and seafood option. Perfect for a light dinner to balance out all that couscous! 7 Zkak Rouah, Fez Medina. Open Tues – Sun. +212 6 94 27 78 49. Reservations Required. Chez Rachid at Bab Boujeloud – Get down with the locals at this ragamuffin café just inside the blue gate. Tagines and brochettes are whats on the menu but everyone really comes here to watch the passersby. Bab Boujeloud, Fez Medina. Open Daily. No Reservations. Riad Rcif – Traditional home-made Fassi-Moroccan food in an upscale venue. Reserve ahead and get a table on the terrace to really take in the sunset. If you haven’t tried the pastilla yet, this is the place to do it. Avenue Ben Mohamed El Alaoui, N° 1 Takharbicht Laayoune Rcif. Open Daily +212 (0)5 35 74 00 37. Reservations Highly Recommended. Café Clock – Cosmo-hippy atmosphere. Inside and terrace eating. Moroccan/Middle-Eastern cuisine. Famous for the Camel Burger. Many events are hosted here (movies, concerts and cooking classes). No alcohol. 7 Derb El Magana. +212 (0)5 35 63 78 55. Open Daily for breakfast, lunch and dinner. No Reservations Needed. Riad Salama – Moroccan food in luxurious courtyard, weather permitting of course. Reservations required. Derb Ahl Tadla No 4. 212 (0)5 35 63 57 30. Tues – Sun for Breakfast and Dinner. Reservation Required One Day Prior. Mezzanine – A chic, hip little joint located just outside the medina. A complete bar, lounge and rooftop terrace are the main attractions here. A great stop for Spanish-style tapas, select Moroccan dishes and a latenight cocktail. Avenue Moulay El Hassan. +212 (0)5 35 63 86 68. Open Daily, Noon-1am. No Reservations Needed. Kai Tai – Thai and Sushi… in Morocco! Located in the ville nouvelle, outside of the medina. A great stop for a lighter lunch or dinner for those craving something decidedly un-Moroccan. 12 Boulevard Ahmed Chaouki. +212 (0)5 35 65 17 00. Open Daily. No Reservations Needed.